Model SAG Stamped Architectural Grilles provide a high end, decorative appearance providing an artistic splash to showcase your space. Integrate into renovation projects of historical spaces. 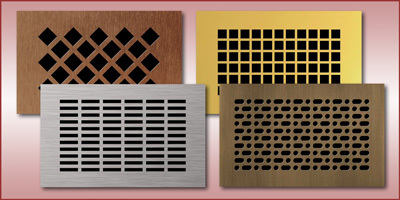 Supply air outlets and inlets for use in Heating, Cooling, or Ventilation air systems. Custom fabricated to size desired. Larger sizes can be manufactured in sections. Steel, Stainless Steel, Aluminum, Brass, Bronze metals in varying thickness. Painted, polished, and anodize finishes available (material dependent). Many patterns to choose from. Custom patterns can be created. Screw holes for mounting. Countersunk or clearance holes (thickness dependent). Model OB-1 Volume Control Damper (Opposed Blade).